ENCOURAGING PROMISE! 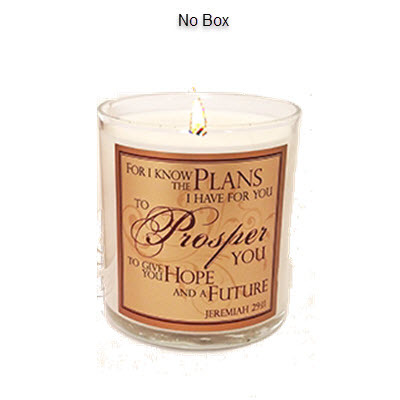 Dynamic words of life from The Father to His children: "For I know the Plans I have for you to Prosper you to give you a Hope and a Future"(Jeremiah 29:11) are artistically presented in this container candle. We paired the profound message of Scripture with the delightful and light fruity scent of POMEGRANATE, which speaks of the favor and blessings of the LORD. Bless someone with this uplifting candle and keep one in your home as a reminder of HIS watchful care! Approximate burn time of 26-30 hours, 8.7 oz by volume.